53 per cent of people say it’s alright – with nearly three-in-five Dubliners say they’ve no problem calling from the loo. This isn't quite what we want to think of when someone is 'doing business'. MORE THAN HALF of Irish people believe it’s acceptable to make phone calls and send SMS messages and emails while on the toilet, according to a survey published today. The ‘Bacardi Together’ poll carried out by Behaviour & Attitudes found that 53 per cent of people believe there is nothing wrong with making or taking a phone call, or sending some other kind of communication, while sat on a toilet. Dubliners were more likely to find the divisive habit acceptable, with 59 per cent of respondents in the capital giving their approval. The poll also discovered that exactly 50 per cent of adults check their phone for texts or social media updates as the last thing they do before bed, while 49 per cent act similarly first thing in the morning. 38 per cent of people claimed to own a smartphone, though over three-quarters of respondents said meaningful relationships could only be built up and maintained through face-to-face communcation. Perhaps surprisingly, 60 per cent of the online population felt that there should be a mass-organised ‘social media free’ day – though only 8 per cent felt they were at risk of ‘burnout’ from social media sites. In the five counties who responded frequently enough to tally, Kildare people averaged out as having the most Facebook friends with 214. Meath people were the least friendly, with an average of 110 each. Pessimistically, Meath people also thought their county provided the least entertainment of the five, and felt themselves to be the least friendly. Good news for the crowds in Pairc Tailteann, but bad news for the county’s tourism hopes. 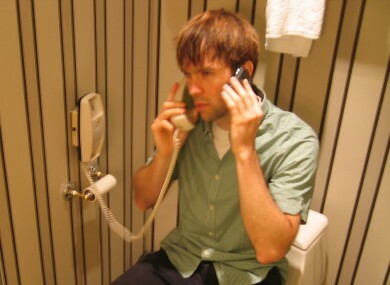 Do you think it’s okay to make phone calls from the loo? Email “Half of Irish people think it's OK to make phone calls from the toilet”. Feedback on “Half of Irish people think it's OK to make phone calls from the toilet”.